Here at Park Dental, we understand that accidents happen. Sometimes these accidents manifest as a broken or damaged tooth and it may seem impossible to fix. However, Dr. Hughes, Dr. Mojdami, Dr. Cakmakci and our team are highly skilled at providing inlays, onlays, and fillings. These three treatments can restore and strengthen a broken tooth. Take a look at your options below! Many patients mistake an onlay or inlay for a dental crown, but they are quite different. A crown is an artificial tooth cap that is placed over the entire tooth. Whereas an inlay/onlay is a porcelain implement that is fitted to the damaged area, and does not encapsulate the whole tooth. Inlays are meant to restore a tooth that has been damaged near the centre, away from the cusps. Onlays can restore a broken tooth that has received damage to the centre and/or cusps of the tooth. Inlays and onlays are designed to fit the empty area exactly, leaving your tooth whole and functional again. However, your treating doctor will determine if a crown or an inlay/onlay is best for your smile. 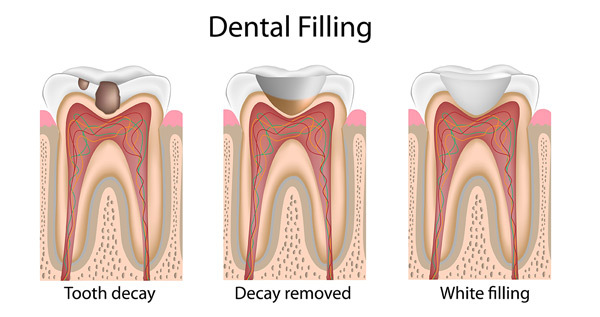 Fillings are quite different from onlays/inlays, but still serve to preserve a patient’s natural tooth. This treatment is optimal for patients who are undergoing root canals or have cavities that need to be eradicated. A filling is comprised of a tooth-colored dental resin that is inserted into the open cavity. It’s flexible, but durable, preserving the structure of the tooth and remaining nearly invisible on the surface level. Just because a tooth becomes physically damaged doesn’t mean that you need to live with the damage. Instead, pay us a visit at Christie Park Dental and learn about the many advantages of onlays, inlays, and fillings. You can still keep your natural smile here in Toronto.